My Dell XPSM1210 has developed these weird lines right in the middle of the screen. When I connect an external monitor the lines disappear and the display is fine. Is this a problem with the screen panel, and if it needs replacement is there a place where I could buy one? This laptop is not under warranty so I'm willing to get the screen replaced. It can be one of 4 things, of the top of my head. The screen itself. Solution: Probably needs to be replaced. Quite annoyingly so because it's always more expensive. Computer repair shops or Dell. More rarely, the inverter board. I find it odd the lines are white. So why I thought of this one. Solution: Needs to be replaced. Cheaper than the above two. Bad soldering or dislodged cable. Solution: The cheapest, eh. No replacement parts. Just putting things back in place. Not the answer you're looking for? 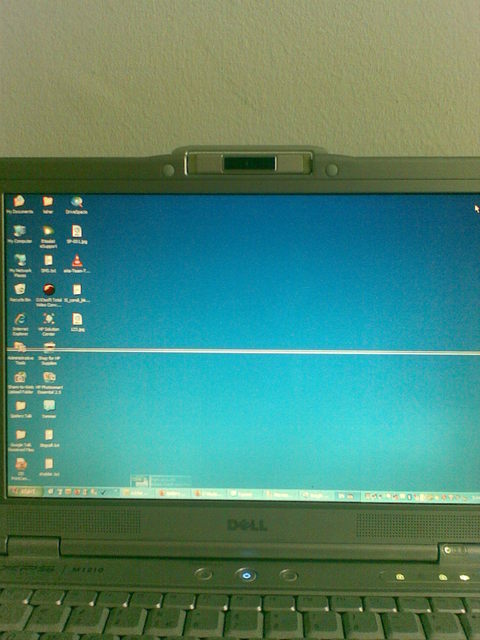 Browse other questions tagged lcd laptop-repair dell-xps or ask your own question. distorted lines across entire screen, also on replaced lcd, but ext. monitor works, advice? Laptop lcd freezes and fades white sometimes (or short horizontal lines on black background), does this indicate a problem with the LVDS cable?